“The Europeans have a strong tradition with baked goods,” “When you travel abroad, you see the distinctive holiday pastries of each region from year to year – familiar shapes, recipes, and flavors." We hope you enjoy our Marliscious selection of fresh homemade cakes! Most cakes or Tortes are 10in. Moist fresh grated carrot cake with pineapples and raisins. The carrots and pineapple work together to keep this cake moist and wholesome. 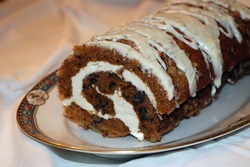 Topped with a light cream cheese frosting. This chocolate lover’s delight is a rich chocolate layer cake filled with chocolate butter cream and topped with a rich chocolate Ganache. 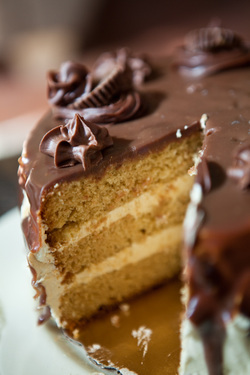 This vanilla peanut butter cake is filled with silky whipped peanut butter cream and enrobed with a chocolate Ganache and decorated with peanut butter cups. This is fast becoming a favorite of both young and old. Rich Chocolate cake with layers of vanilla cream filling and topped with more icing and crunched cookies. Our Signature cake has 8 delicate crepe like layers of vanilla sponge cake separated by layers Vanilla Buttercream icing, Apricot preserves and Marzipan all enrobed with White Chocolate Ganache. This is truly a cake that will make a statement at your next gathering, it tastes good too. 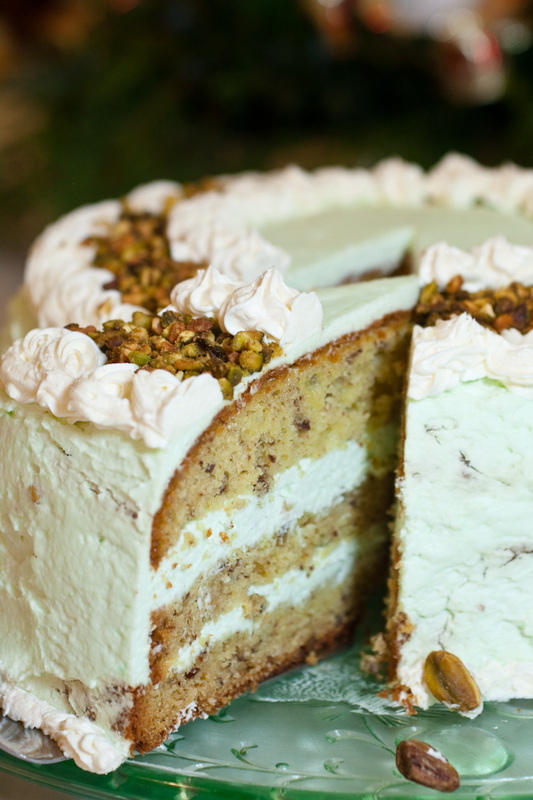 This is a refreshing cake for your Easter and summer parties. This cake begins vanilla cake layered with Lemon curd and creamy Lemon icing. 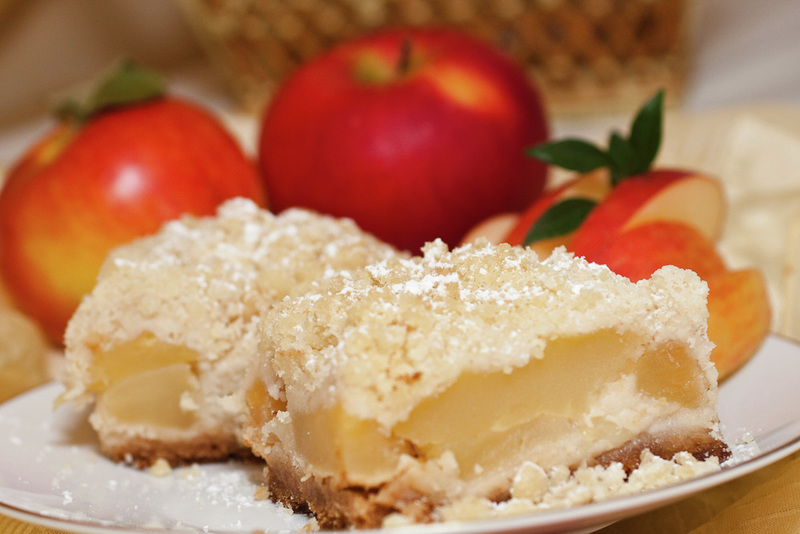 The top also has a layer of divine lemon filling. 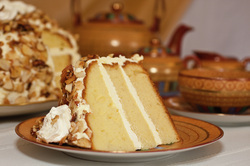 Lemon adds a welcome brightness to the vanilla cake layers. A rich chocolate layer cake filled with fresh chocolate butter cream laced with a hint of coffee, topped with butter cream frosting and chocolate covered coffee beans. 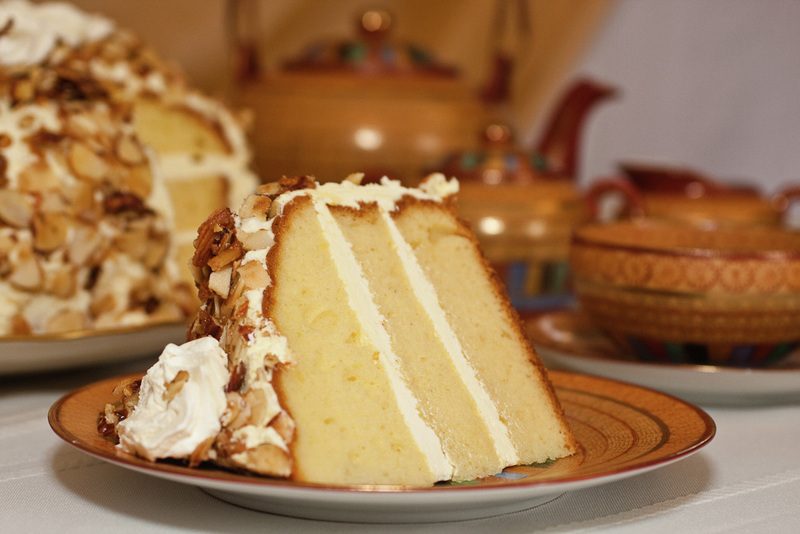 A customer favorite consisting of a golden buttery sponge cake layered and then filled with rich butter cream icing, and finally encrusted with roasted butter almonds. A vanilla layer cake filled with whipped vanilla butter cream and fresh strawberries from local farmers, topped with vanilla butter cream frosting and fresh plump strawberries. I use only fresh ripe strawberries; therefore this cake is only available when the strawberries are the most ripe and flavorful. This cake has 8 delicate crepe like layers of vanilla sponge cake separated by layers Chocolate Buttercream icing, all enrobed with Chocolate Ganache. A cake truly fit for Royalty. Prinzregententorte History: This cake was dedicated to Prince Regent Luitpold of Bavaria in 1886 by the Court confectioner Julius Rottenhöfer, who claims to be the creator. The baker, one Anton Seidl has also claimed the honors as has a bakery but as far as I’m concerned; the person that named the cake should take the honors. At the same time, it was dedicated to the State of Bavaria because the eight sponge layers were intended to symbolize the then eight governmental districts. This berry season favorite is a vanilla cake layered with pureed raspberries and whipped raspberry icing. Then this flavorful cake is covered with vanilla buttercream and topped with more raspberry icing. For more information about our cakes, or to place an order, please click here. I am always adding exciting new cake selections so check back often.